The pharmaceuticals industry processes items including ultra-sensitive groups of goods, such as ADR Classes 1 and 7, which require special transport chains. Transporting goods with particularly high com­mercial values through Europe’s urban conurbations is also a challenge for all logistics companies. Schmechel has been transporting goods that require protection from criminal attacks for more than 20 years. A closed, so-called “box truck” offers only little protection from professional attacks. That is why Schmechel itself started to develop special trailers to allow it to transport goods worth millions of euros securely. Now, Schmechel’s trucks travel throughout Europe, with mechanical protection that is equivalent to a safe, and with electronic controls. 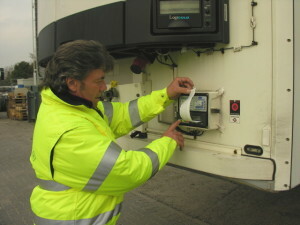 Our significantly enhan­ced equipment, the complexity of our order management, and vehicle control for the trucks on the road is reflected in an increasing number of employees who ensure the operation of our numerous data systems, who professionally manage and control our maintenance activities, and who permanently train our dispatchers and drivers. Without this type of expertise, transporting products that are subject to statutory radiation protection is not possible. Schmechel organises the transportation of these products using various means of transport in several European countries with their respective national regulations. Substances containing peroxide are also used in the pharmaceuticals industry. Here too, there are special statutory regulations, and these substances can only be transported by specially qualified employee, special technical warehouse equipment, and subject to the conditions of ADR Class 1. Schmechel offers supply that is synchronised with production for pharmaceutical production operations – and not only for such sensitive hazardous materials. Get there with less risk!